Transition and race packet pick-up was from 6am – 7.30am. In typical fashion, I arrived later than I’d wanted at about 7am. Minimal queues for packet pick-up and transition check in meant that I actually had ample time until the swim briefing at 7:50am. A surprise appearance from Team USA Olympian Sarah True in an elite relay team was pretty cool. She completed the swim leg for her team, and was obviously, incredibly fast, fresh from qualifying for the US Olympic Team in Rio next year. After the swim briefing and some words from the Mayor of Boston, we were off. 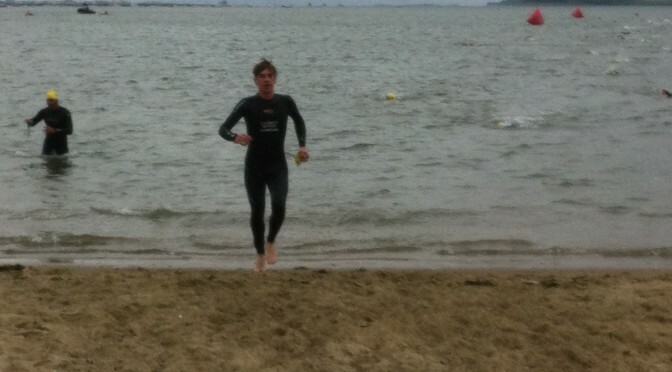 I was in the first wave after the elite, so just enough time to get into my rented wetsuit before my wave start. 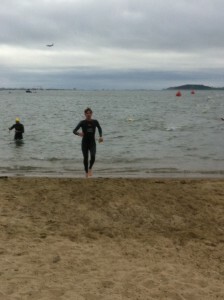 This was my first ever beach entry over a deep water start, and my first ever competitive sea swim, so a day of firsts. Luckily, I’d been down to the beach the previous weekend for a test swim, so at least I’d experienced that part once before, and remembered how to sight, having swum straight on to the beach on my first attempt and swimming parallel to it! Unfortunately, I hadn’t been able to test out my rental wetsuit previously. It fitted fine, but it gave my neck a painful rub during the swim. I should have thought about this and put body glide on my neck. Lesson learned for next time. Otherwise, the swim was pretty uneventful. I think I was sighting pretty well, but my Garmin shows the swim as 1218 yds, which is slightly over the 0.5 mile. Therefore, I’d guess the course was long, but it was perfectly manageable. Transition was very straightforward. With a low bib number (36), I had a spot closest to ‘Bike Out/In’, which meant it was easy to find and minimised running with the bike; perfect spot! With body glide on my wrists and ankles, the rented suit slipped off easily and I was off on my way. Cycling down the beach road. Not another competitor in sight! The bike was on the beach road, closed roads with every intersection monitored by a Massachusetts State Police officer and vehicle. Clearly, the organisers weren’t messing around! 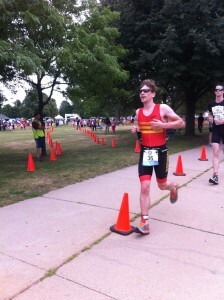 As it followed the beach, it was dead flat and straight – so a proper speed course. At one end, the turn-around was a roundabout and the other was a dead turn around a traffic cone. The wind made one direction easier than the other, but it wasn’t too windy in any case. When I first read the results, I was dead pleased that I came out with an average bike speed of 20.9 mph. Getting over 20 mph has been an ambition of mine for some time. And it would be even more impressive on the road bike, rather than my TT machine. Once again, when the Garmin file is analysed, it turns out to be a short course, at around 8 miles, giving an average speed of 19.1 mph. I shall try again! One thing I definitely got wrong was how much liquid to carry. I’m still a little wary of the Boston weather, and so decided to carry 2 bottles for a 9 mile ride. Definitely overkill! Could have made an easy save of 0.5 kg by ditching a bottle – not that it’d probably translate to a time saving, but still! Marginal gains and all that! Under a minute to rack and change shoes! Very pleased with that! As I said earlier, it helped to have a good rack positioning within transition. 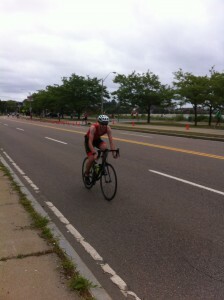 Just out of T2 on the run course. Apparently, I’m a committed heel striker! I’ve never done a race where the run was the longest leg (by far) before! The Garmin says this is accurately measured, at 4.45 miles along the beach road, parallel to the bike course and then along a small spit into the bay. At that point, that was the furthest I’d run all year I think, so I was a little nervous about the run, but it came off fine. Definitely still not back to my fastest run speed, or anywhere near my 10k PB pace, but I’ll get back there. Overall, I think this was a pleasing performance. Especially considering I didn’t even think I would race this year with moving house twice, a bout of plantar fasciitis and not having access to a car in Boston to get to races. Regular cycling and swimming with Edinburgh Triathletes back home is definitely giving me improvements, and once I get back on top of my run, I think I’ll really start to capitalise on that. Just got to get a purple trisuit, rather than my old Serpentine one and I’ll be set. 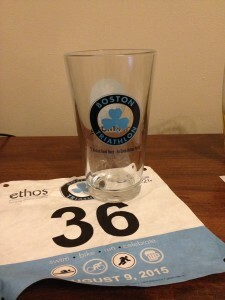 The post-race swag was also excellent – a Boston Triathlon pint glass, along with the usual Gatorade and Muscle Milk, and FREE BEER with a little fold-out bar, complete with bar games. Any race that has a free bar is fine in my book! Let me know if you competed or to ask questions about the race in comments!